In the age of social media, we've become actually less social than ever. And on the other side of the keyboard, people are left feeling more lonely and isolated than ever before. Today's guest has created a solution that works in opposition to loneliness and isolation and in fact, creates deep meaningful relationships. He is the founder of the deck ASK DEEP QUESTIONS. His name is Jan Keck, and this is The YES Effect Show! Jan is a community addict. Growing up as an only child he found his soul family at summer camp, in sports clubs and even politics. When he moved from Germany to Canada in his twenties he had to re-create his community from scratch and learned that the fastest way to make deep connections is through meaningful conversations and experiences. 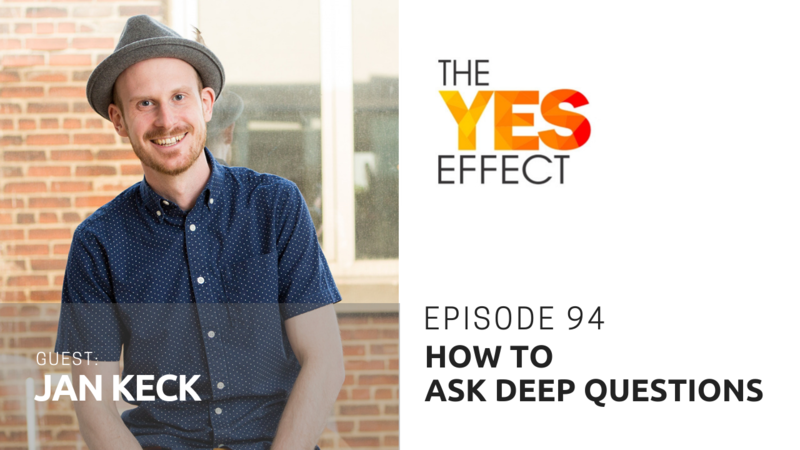 That’s how the ASK DEEP QUESTIONS card deck was born, which has now become the tool for hundreds of people that feel disconnected to start conversations that matter. Not only does Jan now help changemakers connect with their audience on video, he also creates tools and experiences that build deep connections and community. How to move forward with your goals even when you feel you'll never be ready and deal with the "impostor syndrome"